We don't normally celebrate Cinqo de Mayo but who can resist a get together with good friends? And when they bring dinner (a yummy taco salad), too? Totally irresistable! We hosted the party at our house and I offered to make dessert. 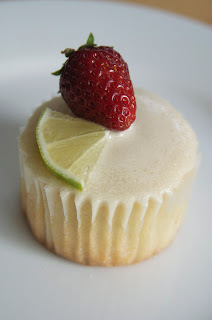 A quick search for cupcakes that matched the occasion and I found Margartia cupcakes. Considering I made Guinness cupcakes on St. Patrick's Day (another holiday we don't really get into), I thought, why not? They turned out awesome! I changed the original recipe and added whole milk to the cake and butter to the frosting. The flavor of the lime really comes through. Next time (and there will be a next time soon with these little ones) I probably will make the frosting a little stiffer although I think the presentation is pretty cute with the addition of the strawberry. Also, I'm going to use green decorating sugar that's a bit coarser or chunkier to make it really look like I rimmed the edge just like a real margarita. Salud!